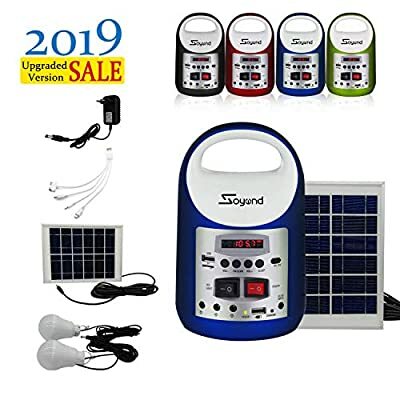 ?Portable Solar Generator with Solar Panel, Solar Powered Generator Inverter, Small Basic Portable Electric Generator Kit, Including 3 Sets LED Solar Lights for Home & Camping, Power for Solar Fans? ?Unit Size: 4.5*4.5*7.3'', portable and handheld. ?Digital LED Display, 8000mAH Battery, long life battery. ?Solar Lighting System, built-in MP3?FM Radio to play music. ?Solar power inverter, Support TF Card. USB Output for charging phones, cameras, iPad, laptops, fans. ?Solar power generator kit, With auto-sleep function to save energy. ?3W output to lamps, as home emergency lights . 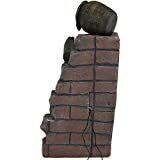 ?Solar lighting system, comes with handle, portable and easy to carry. ?Equips with AC adapter, with high reliability, high efficiency and over charging protection. ?Solar generator system, widely applied to home, camping, hiking, fishing, hunting, expedition, outdoor activities. ? 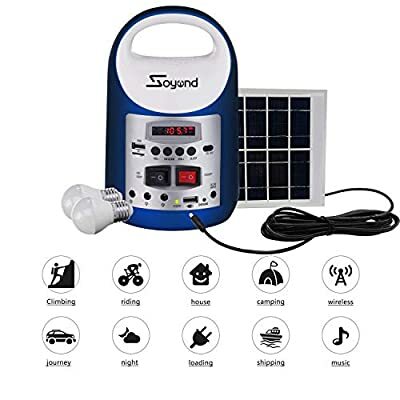 ?Solar Powered Generator, also a small quiet generator for home use, perfect emergency power backup for home, travel, camping. ? 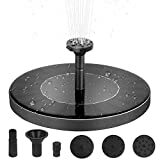 ?60-Day FULL REFUND Guarantee and 12-Month Product Warranty Service. ?JUST BUY WITH CONFIDENCE!? ?Portable Solar Generator Kit-perfect emergency power backup? 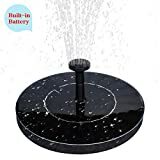 : Solar Powered Generator, perfect emergency power backup for home, travel, camping. 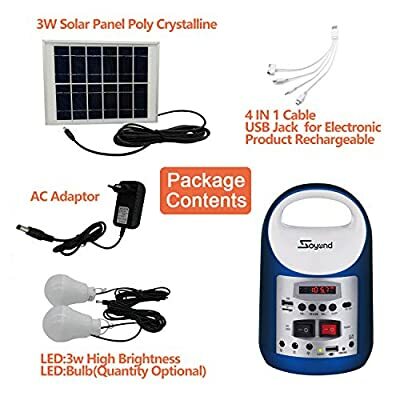 Small Basic Solar Generator Kit, rechargeable & replaceable battery solar generator system, storage solar generator power to battery with solar panel and supply power to LED light and mobile phone. 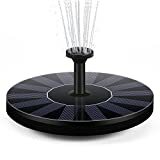 ?Multi-functional Solar Powered Generator-Multiple Outlets? : Solar Inverter, With auto-sleep function to save energy. 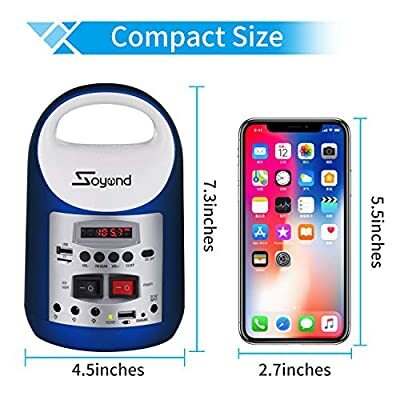 Digital LED display, 8000mAH Battery; 3W output to lamps; 1 input to AC adapter; built-in Buletooth?FM Radio to play music; Support TF Card; USB Output for charging phones, cameras, iPad, laptops, fans; ?Multiple-occasions Used Portable Solar Lighting System? 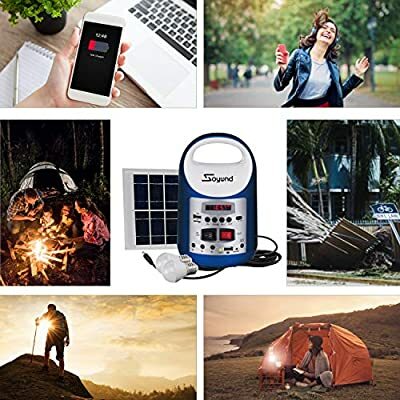 : Portable Solar Powered Generator, Widely applicable to camping, hiking, fishing, expedition, hunting, outdoor activities and home as emergency power supply. Small basic generator kit, comes with a handle, easy to carry; the most suitable for a variety of outdoor leisure, field work; Unit Size: 4.5*4.5*7.3''. 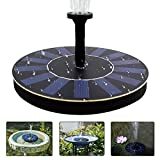 ?Solar Lighting System Package Includes? 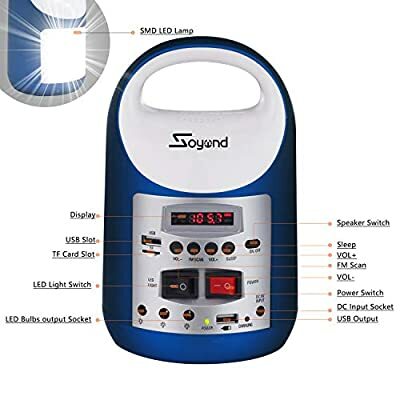 : 1* Portable Power Generator ,1* Solar panel, 2* 3W LED Lamps,1* AC Adapter ,4 in 1 USB Cable; 1* User Manual. ?Worry-Free Solar Electric Generator? : This solar power generator is reliable, supports fast charging, stable, safe and worry-free. Long life battery. We offer 60-Day FULL REFUND Guarantee and 12-Month Product Warranty Service. ?JUST BUY WITH CONFIDENCE! ?